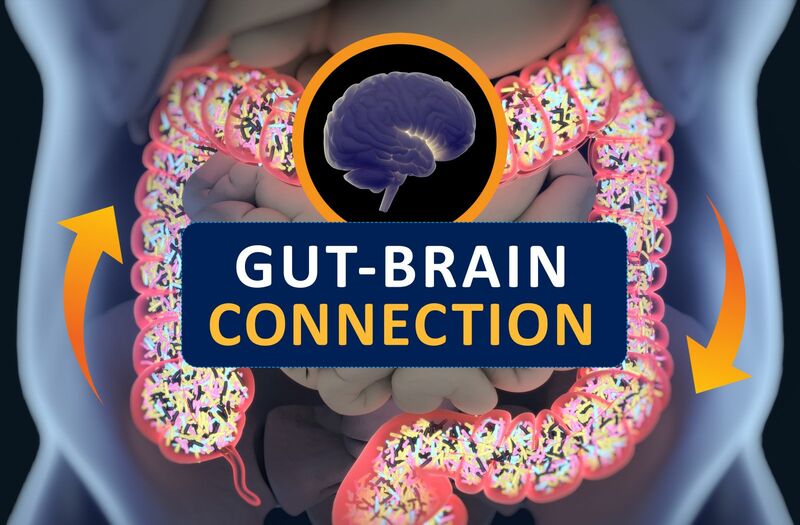 The gut-brain connection is no joke; it can link anxiety to stomach problems and vice versa. Have you ever had a "gut-wrenching" experience? Do certain situations make you "feel nauseous"? Have you ever felt "butterflies" in your stomach? We use these expressions for a reason. The gastrointestinal tract is sensitive to emotion. Anger, anxiety, sadness, elation — all of these feelings (and others) can trigger symptoms in the gut. The brain has a direct effect on the stomach and intestines. For example, the very thought of eating can release the stomach's juices before food gets there. This connection goes both ways. A troubled intestine can send signals to the brain, just as a troubled brain can send signals to the gut. Therefore, a person's stomach or intestinal distress can be the cause or the product of anxiety, stress, or depression. That's because the brain and the gastrointestinal (GI) system are intimately connected. This is especially true in cases where a person experiences gastrointestinal upset with no obvious physical cause. For such functional GI disorders, it is difficult to try to heal a distressed gut without considering the role of stress and emotion. Given how closely the gut and brain interact, it becomes easier to understand why you might feel nauseated before giving a presentation, or feel intestinal pain during times of stress. That doesn't mean, however, that functional gastrointestinal conditions are imagined or "all in your head." Psychology combines with physical factors to cause pain and other bowel symptoms. Psychosocial factors influence the actual physiology of the gut, as well as symptoms. In other words, stress (or depression or other psychological factors) can affect movement and contractions of the GI tract, make inflammation worse, or perhaps make you more susceptible to infection. In addition, research suggests that some people with functional GI disorders perceive pain more acutely than other people do because their brains are more responsive to pain signals from the GI tract. Stress can make the existing pain seem even worse. Based on these observations, you might expect that at least some patients with functional GI conditions might improve with therapy to reduce stress or treat anxiety or depression. And sure enough, a review of 13 studies showed that patients who tried psychologically based approaches had greater improvement in their digestive symptoms compared with patients who received only conventional medical treatment. Are your stomach or intestinal problems — such as heartburn, abdominal cramps, or loose stools — related to stress? Watch for these other common symptoms of stress and discuss them with your doctor. Together you can come up with strategies to help you deal with the stressors in your life, and also ease your digestive discomforts. Q. I'm 70 and exercise 30 minutes a day. I've heard that creatine supplements might help build muscle strength. Is there anything to it? A. Creatine is a natural substance, largely found in muscle, that's sold as a supplement. There's some evidence that it can help young athletes build muscle mass and improve athletic performance that requires short bursts of muscle activity, such as sprinting. For that reason, it is banned by some, but not by all, sports organizations. However, there is little evidence that it can build muscle bulk or strength in older adults. Small studies have suggested that it might be helpful for people with certain diseases more common in older folks, including heart failure and Parkinson's disease. In my judgment, there is currently no convincing evidence of adverse effects from doses that the manufacturers recommend, which are typically 2 to 3 grams per day. However, there are very few studies of sufficient size and duration to be confident about this. Note also that the FDA does not regulate the manufacturing of supplements as it does prescription drugs. So even if the creatine itself is fine, the other substances used to create a tablet or capsule could contain impurities. I think there's little, if any, evidence that creatine supplements could help you build or maintain muscle strength at your age, and, because of the lack of regulation of supplements, there is some potential for harm. I wish there were more solid information, but there isn't. For now, to be on the safe side, I'd advise against taking creatine. Ask the doctor: Do I need gallbladder surgery? Does heartburn feel like a heart attack?